NEW ZEALAND HAS BEEN ON THE WORLDWIDE TOURISM RADAR for such a long time; it’s naturally beautiful and relatively cheap (once you’re there), and everyone speaks English. In fact, it’s been hot for so many years that I’ve sort of avoided it in all my time of traveling because I considered it to be “too easy.” When I went to Australia for the first time over ten years ago, I thought it was great, but I came back home feeling a little ripped off. I mean, I like traveling to be a little challenged and immersed in a foreign culture, and Australia — as amazing its Outback and Great Barrier Reef were — the overall experience was very easy and American to me, albeit in the accent of Crocodile Dundee. Sure, that’s to be expected from a country that was also a former colony of the British empire, but when you factor in the airfare to get to such a place from New York, it doesn’t exactly have a big value for a journey outside the comfort zone — for me anyway. For years, I’ve felt this way about New Zealand; it’s on the other side of the world from where I’m based in the American northeast, and I never saw the huge value in going there, as beautiful as it might be. Besides, John McClain and others I’d met on the W trek in Chile’s Torres del Paine National Park had convinced me that New Zealand was comparable to the scenery of Patagonia where we’d all trekked through, and at least Patagonia had a language barrier to make it feel like I was somewhere else. With that said, I had no real motivation for going to New Zealand on my own dime — but with the luck of Life’s dice, I was already in Brisbane as a layover from my Papua New Guinea assignment, and I had just enough frequent flyer miles to do a free side trip to the Land of the Kiwis. Sure, what the hell — why not? Ultimately, I was welcomed by a series of rainbows as I flew in. Walking around the downtown district of Queenstown, which you can see all of in forty minutes or less since it’s only about half a mile in total area, you can’t avoid seeing all the tour offices, where you can sign up for bungee jumping, jetboat rides, canyon swings, off-road adventures, horseback riding, paragliding, Lord of the Rings tours, Maori culture shows, scenic gondola rides, lake cruises, bike rides, etc. — all of which are available to do year round, even in the June-September winter season when it’s a bit chilly. For me, I’d already done things like jetboating, bungee jumping, skydiving, and handgliding in other parts of the world, and decided that since all of those things could get pricey if you add them all up — and the fact that it was winter — I’d concentrate on things that were winter specific, i.e. snowboarding. “Well, what are the perks?” I joked. My rental jacket was merely one of the staff jackets for the three ski areas operated by the same company: Remarkables, Coronet Peak, and Mt. Hutt (further up north on South Island). All I needed was a name tag. I sat on the bus, which traveled 45 minutes to get to the parking lot of the Remarkables ski area. Thirty of those minutes were spent going back and forth the switchbacks up the mountain; Queenstown is only at an elevation of about 1,200 ft. ASL (not alpine enough), so to get to the snow, you basically just drive up the elevation of one of the Remarkable mountains until you get above the snow line. “Have you been up yet?” I asked the young Australian man from Byron Bay sitting next to me. He and his parents, also on the bus, were on ski holiday for a week. True, while Australia does have small mountains to ski and snowboard, it’s nothing compared to making the trip out to neighboring New Zealand to get a better experience. I told him it was the same in the New York City area; while there are several decent (albeit icy) mountains within 90 minutes of the Big Apple, to get a real experience, you have to go out west to Colorado or Whistler in Canada. I told him how earlier in 2013, I went to Breckenridge, CO with Jack (Spain, Oktoberfest), where we met up with my Colorado friends Nicole, Neeraj, and Mark — New Yorkers-turned-Colorado “snow snobs” — who only went skiing/riding with us in their unseasonable, less-than-stellar winter conditions as a courtesy for us visitors. “We don’t go out in this,” they’d say on a day which Jack and I (and anyone from the American coasts) would think was an awesome snow day. “Anything’s better than New York,” I told the Aussie. “Anything’s better than Australia,” he replied. 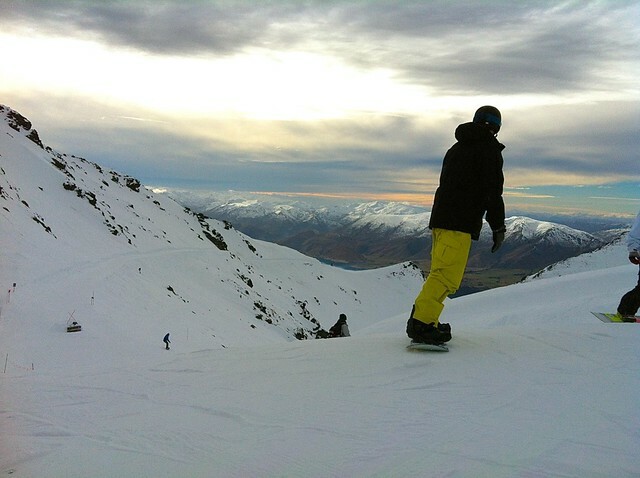 I was on my own for most of the day, snowboarding at the Remarkables ski area, which was fine because the “Double Diamonds” playlist of techno action music blasting in my earbuds from my iPod nano wristwatch, kept me company. Plus, I could go on the faster singles lines at all the lift loading areas, which was great because I made conversations with a few of the chairmates on each ride up — most of them Australian. “It’s icy, but hey, anything to get a run in,” one told me. I agreed. “This is already better than anything in New York,” I said after we’d discussed our ski situations in our respective homes. Ironically, Jay-Z and Alicia Keys’ “Empire State of Mind” came on — their tribute to the Big Apple. I begged to differ. Sure there was a decent terrain park, but if you’re just a guy who just likes to ride like me, there weren’t many trails to ride, with lots of them having solid ice patches — I’d heard Coronet Peak was worse. In the end of trying it all, there was only one decent run in the entire ski area (given the conditions at the time), from the top of Shadow Basin (picture above). I rode this over and over until it started to get repetitive. Fun nonetheless — but repetitive. I could have mixed it up with trails from one of the other lifts, but they were crowded — and all for those runs weren’t as long or exciting. “How big is it?” I asked an old Aussie lady on a chairlift ride. Twice the size? I thought to myself. That’s still nothing like Whistler or anywhere in Colorado. I soon realized that after you snowboard some of North America’s best ski resorts, you become a snow snob yourself. And then, during on one chairlift ride up, I noticed an ad attached to the safety bar in front of me — for one of the heli-ski companies in town. I knew that if my M.O. for my short time in New Zealand was to do the “winter sports thing,” there was only one way I could go: up. NEXT UP: Waiting for weather amongst a bunch of kids on gap year. Also, scenes from Middle Earth.